TEL AVIV, Israel — It was a mystery that stumped even the brightest minds at Israel's Antiquities Authority for almost six months. 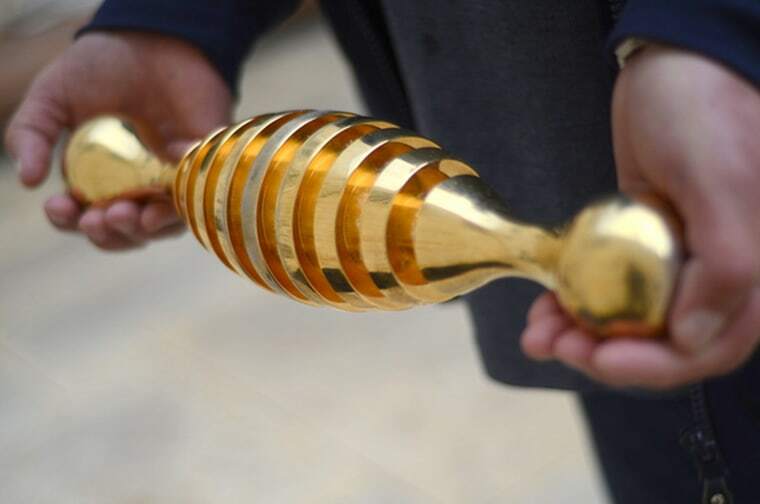 The shiny gold object uncovered at a cemetery was shaped almost like a rolling pin, but those assigned to identify its use were baffled. “To tell you the truth I’ve never seen anything like this before,” Amir Ganor, head the authority's robbery prevention unit, told NBC News. After digging the 19-pound gold object out, the maintenance worker thought he might have found an explosive. He called the bomb squad unit, who carried out a controlled explosion. The blast didn't damage the object at all — and after establishing it was safe, police handed it over to Ganor's unit. Determined to find out what he had unearthed, Ganor and his team took it to a jeweler for examination. They learned the object was coated in 24-carat gold, then they x-rayed it and found out it was solid metal. After months of failing to establish what it was they turned to the public for help, posting a picture on Facebook page early Tuesday and asking for suggestions. Within hours, hundreds of responses had flooded in. One said it was a cattle insemination instrument. Others suggested a tool for rolling dough, or pieces of industrial machinery, watches, a massage object, or something related to temple worship. “The object, which is produced by a German company, is called ‘Isis Beamer’ after the Egyptian goddess Isis,” they said. “In Egyptian mythology she was the goddess of medicine, magic and nature,” the authority added in a Facebook post confirming the answer had been found. Henry Austin reported from London.